James Monroe constructed and resided at Oak Hill near Aldie after his presidency. American Civil War Brigadier General Robert H. Chilton (Chief of Staff under Robert E. Lee) was a native of Loudoun County. World War II general George C. Marshall resided at Dodona Manor in Leesburg. Essayist and journalist Russell Baker grew up in Morrisonville, Virginia and his book Growing Up highlights his childhood in rural Virginia. Entertainer Arthur Godfrey lived near historic Waterford, Virginia. 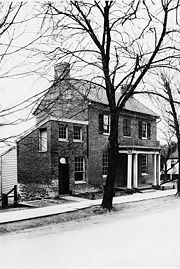 Loudoun County is also notable for being the birthplace of Julia Neale Jackson, mother of Stonewall Jackson, and Susan Catherine Koerner, mother of the Wright Brothers. Loudoun County is one of the most Republican-leaning counties in Northern Virginia . Prior to the 2008 election, it had not voted for a Democrat for President since Lyndon B. Johnson in 1964. In recent years, however, the county has experienced rapid growth in its eastern portion, driven mainly by commuters drawn by the close proximity to Washington, D.C. This has made Loudoun more competitive. Nevertheless, after giving Senator Barack Obama nearly 54% of its presidential vote in 2008, the county shifted back to the GOP in 2009; Republican Robert F. McDonnell received 61% of the gubernatorial vote. Voters also removed two incumbent Democratic delegates, making Loudoun's state House delegation all-Republican. Like many counties in Virginia, Loudoun is governed by a board of supervisors, the Loudoun County Board of Supervisors. The Chairman of the Board is elected by county voters at-large while the remaining supervisors are elected from each of eight electoral districts. All nine members serve concurrent terms of four years. While the board handles policy issues and sets the budget, day-to-day operations of the county government are handled by a County Administrator appointed by the board. The 2003 board, among other officials in Loudoun, was the subject of a federal investigation of possible corruption relating to a land deal involving the Royal Saudi Academy. In November 2007 voters removed four incumbent pro-growth Republicans from the existing Board of Supervisors in a backlash over rapid development in the eastern portion of the county. The make-up of the board following the election was five Democrats, two Republicans, and two Independents. In November 2011, Republicans were elected to all nine seats on the Board. The current Chairman is Scott K. York and the current Vice-Chairman is Janet Clarke, the Blue Ridge District Supervisor. According to the U.S. Census Bureau, Loudoun County has a total area of 521 square miles (1,350 km2), of which 520 square miles (1,300 km2) is land and 1 square mile (2.6 km2) (0.24%) is water. It is bounded on the north by the Potomac River; across the river are Frederick and Montgomery counties in Maryland; it is bounded on the south by Prince William and Fauquier counties, on the west by watershed of the Blue Ridge Mountains across which are Jefferson County, West Virginia and Clarke County, and on the east by Fairfax County. The Bull Run Mountains and Catoctin Mountain bisect the county. To the west of the range is the Loudoun Valley. Bisecting the Loudoun Valley from Hillsboro to the Potomac River is Short Hill Mountain. Traditionally a rural county, Loudoun's population has grown dramatically since the 1980s. Having undergone heavy suburbanization since 1990, Loudoun has a full-fledged service economy. It is home to world headquarters for several Internet-related and high tech companies, including Verizon Business, Telos Corporation, Orbital Sciences Corporation, and Paxfire. Like Fairfax County's Dulles Corridor, Loudoun County has economically benefited from the existence of Washington Dulles International Airport, the majority of which is located in the county along its border with Fairfax. Loudoun does retain a strong rural economy in the western part of the county. The equine industry has an estimated revenue of $78 Million. It is home to the Morven Park International Equestrian Center which hosts national horse trials. In addition, the county's growing wine industry has produced several internationally recognized wines. Loudoun now has 22 wineries and over 25 active farms. 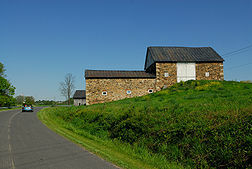 Loudoun has rich soil and was in the mid-19th century a top wheat-producing county in the fourth largest wheat-producing state. MCI, Inc. (formerly WorldCom), a subsidiary of Verizon Communications, is headquartered in Ashburn, Loudoun County. It announced that it would move its headquarters to Ashburn in 2003. AOL had its headquarters at 22000 AOL Way in Dulles in unincorporated Loudoun County. In 2007 AOL announced that it would move its headquarters from Loudoun County to New York City; it would continue to operate its Virginia offices. Orbital Sciences Corporation has its headquarters in Dulles. Before its dissolution, Independence Air (originally Atlantic Coast Airlines) was headquartered in Dulles. At one time Atlantic Coast Airlines had its headquarters in Sterling. Prior to its dissolution, MAXjet Airways was headquartered on the grounds of Washington-Dulles International Airport. The county is served by Loudoun County Public Schools (LCPS). LCPS currently serves over 50,000 students from Kindergarten through 12th grade and is currently the fifth largest school system in Virginia. While there is a growing trend towards home schooling in the county, the vast majority of school age children in Loudoun County attend LCPS schools. Loudoun County schools recently ranked 11th in the United States in terms of educational achievement versus funds spent. Loudoun County also sends students to Thomas Jefferson High School for Science and Technology, a Virginia Governor's School in Alexandria, Virginia. Loudoun County is home to nine private schools: Loudoun Country Day School, a Pre-K–8 independent school located in Leesburg; Notre Dame Academy, an independent non-denominational day high school in Middleburg; the Foxcroft School, a boarding school for girls located in Middleburg; Dominion Academy, a Non-denominational Christian school, K–8 located in Leesburg; Leesburg Christian School, a K–12 school located in Leesburg; St. Theresa School, a K–8 Roman Catholic school located in Ashburn; Village Montessori School at Bluemont, an accredited Pre-K through Elementary Montessori school located in Bluemont; Christian Faith & Fellowship School, a PreK–12 non-denominational Christian school and Loudoun County's only private school accredited by the Association of Christian Schools International; and Ideal Schools High School, an independent non-demoninational school in Ashburn. In terms of post-secondary education, Loudoun County is home to a variety of colleges and universities, including: Patrick Henry College; a branch of Northern Virginia Community College in Sterling; George Washington University (satellite campus); George Mason University (satellite campus); Marymount University (satellite campus); Shenandoah University (satellite campus); and Strayer University (satellite campus). Loudoun is also home to the Janelia Farm Research Campus of the Howard Hughes Medical Institute.